Nowadays sending email is a very complicated procedure. However, there is a very good reason for this: Email with a fake "from" address, which can be very harmful to your reputation as a company. Of course Copernica can't just start sending email in your name either. First you need to configure your DNS, which is a complicated matter that is simplified with sender domains. 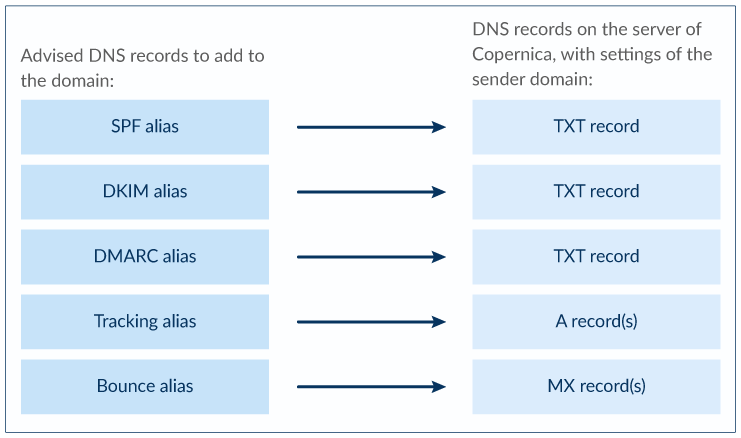 The sender domain handles complicated matters such as MX, SPF, DKIM and DMARC, allowing Copernica to send email for you. This is why sender domains are also mandatory. We will create the DNS records for you and maintain the records, you just refer to our DNS server. That's all. In our quick-start guide to set up sender domains we already explained all the aliases that you had to set up. In this article we will focus on the more advanced features of sender domains. Subdomain or the main domain? If you set up a sender domain you can choose whether you want to do this for the main domain, say yourcompany.com, or for a subdomain, like newsletter.yourcompany.com. Of course, it is way more elegant if all your email messages are sent from the main domain, including your newsletters and n email. But your main domain is probably already in use for sending out email and you therefore also have already set up DNS records to enable this. If you do not want to risk breaking things by modifying your existing DNS settings, you can opt for a subdomain instead, and use this subdomain for the mails that you send with Copernica. If you send with a subdomain you do not have to make changes to any existing DNS records, and only have to add completely new records. Setting up a subdomain is safer and easier than setting up a Sender Domain for a subdomain. If you do choose to use the main domain, you must pay close attention to a couple of DNS settings. Especially the DMARC settings require attention. For information how to set these up you can refer to the article on DMARC. If you create a Sender Domain in Copernica, we update our DNS servers and add records holding settings that are relevant for you. In your DNS you then only have to add aliases (using CNAME records) to these records in our DNS. The dashboard of the Marketing Suite exactly lists the records that you have to add to your DNS, and warns you if you make a mistake in setting up these aliases. Because you create aliases to records that are hosted by us, we can at any time make changes to your DNS. If we discover that we need extra IP addresses to send out your messages, or when we want to rotate your DKIM keys, we can change the DNS without contacting you. Your alias just points to our DNS server, where we can make all relevant changes. The A, MX and DKIM records are normally easy to set up. The DNS standard allows to create as many of these records as one need, and they cannot conflict with other records. SPF is also not an issue because we use a subdomain for collecting bounces. DMARC however, might require extra attention, because it can cause a conflict.